One size doesn’t fit all. Proven technology, rock-solid reliability and an unbeatable combination of performance and fuel efficiency. High-displacement volume and premium MPI fuel injection combine to deliver outstanding acceleration, instant planing and smooth performance throughout the rpm band. Mercury® SmartCraft® Digital Throttle & Shift is standard, providing precision throttle response and effortless steering. Electronic multi-port injection (MPI) and standard Emissions Control Technology (ECT) combine to deliver precisely the correct amount of fuel for every stage of operation – no more, no less. The result is fuel economy that stretches your boat’s range and your dollar. The freshwater closed-cooling system (standard) dramatically limits potential corrosion. 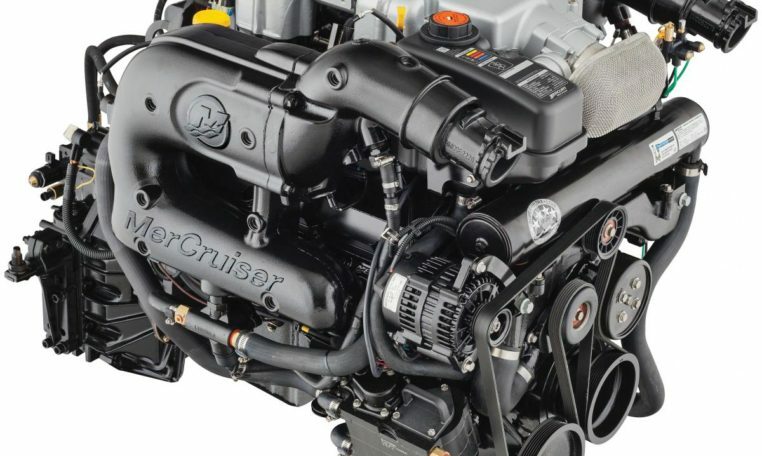 In fact, Mercury® is so bullish about the anti-corrosion technology built into these engines, we offer a standard four-year limited corrosion warranty in addition to the three-year limited factory-backed warranty. Mercury’s Engine Guardian continually monitors critical sensors for any sign of a problem and immediately takes action, while the water-cooled Cool Fuel delivery system prevents vapor lock. Rugged construction, including stainless-steel exhaust, ensures long-term, hassle-free operation.